(Phys.org) —A genetically engineered tobacco plant, developed with two genes from blue-green algae (cyanobacteria), holds promise for improving the yields of many food crops. Plants photosynthesize – convert carbon dioxide, water and light into oxygen and sucrose, a sugar used for energy and for building new plant tissue ­– but cyanobacteria can perform photosynthesis significantly more quickly than many crops can. "This is the first time that a plant has been created through genetic engineering to fix all of its carbon by a cyanobacterial enzyme," said Maureen Hanson, a co-author of the study and Liberty Hyde Bailey Professor of Plant Molecular Biology at Cornell. "It is an important first step in creating plants with more efficient photosynthesis," Hanson said. The study is published Sept. 17 in the journal Nature. Myat Lin, a postdoctoral fellow in Hanson's lab, and Alessandro Occhialini, a scientist at the U.K.'s Rothamsted Research, are co-lead authors of the study. Crops with cyanobacteria's faster carbon fixation would produce more, according to a computer modeling study by Justin McGrath and Stephen Long at the University of Illinois. Producing more crops on finite arable land is a necessity as the world's population is projected to pass nine billion by 2050. 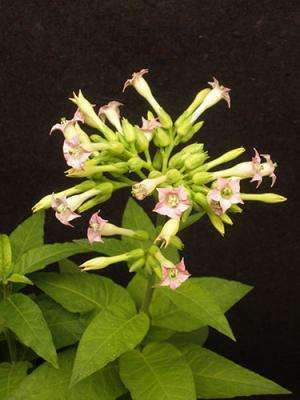 Though others have tried and failed, the Cornell and Rothamsted researchers have successfully replaced the gene for a carbon-fixing enzyme called Rubisco in a tobacco plant with two genes for a cyanobacterial version of Rubisco, which works faster than the plant's original enzyme. All plants require Rubisco to fix carbon during photosynthesis. Rubisco reacts with both carbon dioxide and oxygen in the air, but when it reacts with oxygen, a plant's rate of photosynthesis slows down, leading to lower yields. In many crop plants, including tobacco, Rubisco is less reactive with oxygen, but a trade-off leads to slower carbon fixing and photosynthesis, and thus, smaller yields. The Rubisco in cyanobacteria fixes carbon faster, but it is more reactive with oxygen. As a result, in cyanobacteria, Rubisco is protected in special micro-compartments (called carboxysomes) that keep oxygen out and concentrate carbon dioxide for efficient photosynthesis. In previous research, Lin, Hanson and colleagues inserted blue-green algae genes in tobacco to create carboxysomes in the plant cells. In future work, the researchers will need to combine genes for cyanobacterial Rubisco with genes for carboxysomes in the tobacco's chloroplasts, the site in the cell where photosynthesis takes place.